The Lucene index provides access to all data in your Novell Vibe site. If it becomes damaged or out-of-date for some reason, you can rebuild it. Users might first notice a problem with the Lucene index if they cannot find information that they know should be available on the Vibe site. If you are running multiple Lucene Index Servers, follow the instructions in Section 26.5, Performing Maintenance on a High Availability Lucene Index. The steps to reset the search index differ depending on whether you have multiple Lucene Index servers. 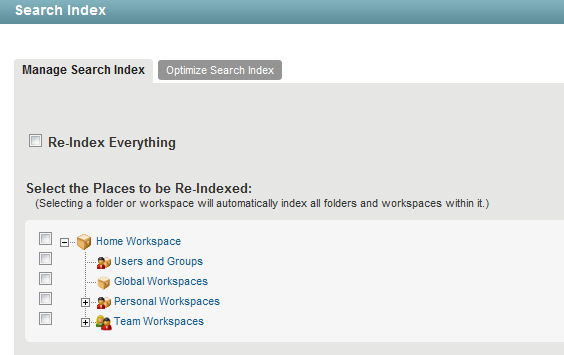 In the Management section, click Search Index. To reindex the entire Vibe site, select Re-Index Everything. Depending on the size of your Vibe site, this can be a very time-consuming process. Select one or more parts of your Vibe site to reindex. Click OK to start the indexing. Users can still access the Vibe site during the indexing process, but search results might not be accurate until the index has been completely rebuilt. A message notifies you when indexing is complete. In the Search Index section, click Index. Select each node that you want to re-index.